Dear Kids; A long time ago, when you were little, Mom and I took you to where we wanted to build a house… I remember there was one tree, however, that the three of you couldn’t stop staring at. 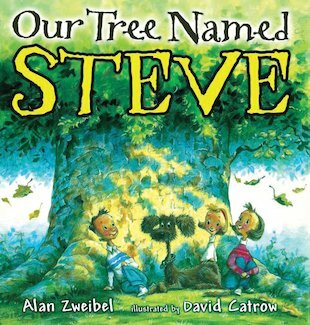 When the family move into their new home, Steve the tree quickly works his way into their lives. Swing, campsite, laundry line and trysting place – he is at the centre of everything they do. He holds their underwear when the dryer breaks down, he’s there when Adam and Lindsay get their first crushes, and he’s the focal point of outdoor family parties. So years later, when Steve is destroyed in a storm, Dad writes a letter to all the children to tell them the news… A homage to a favourite tree forms the heart of this bittersweet tale of life, death and change.